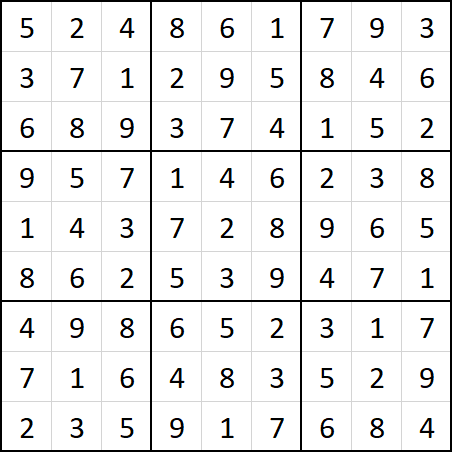 Someone I find very trustworthy continues to insist that this is a valid Sudoku board. It's been a while since I've played, but surely there's a couple of things off here, right? Alright, so that someone is me. And as it turns out, there are a few things off here. What's the solution to this board? And how does this board work? Here is the final solution. The small numbers reminded me of a nonogram and sure enough it has the following solution. In the comments, the author hinted that the solution to the nonogram connects to the fractional values. So, cross checking with the original puzzle we find that all of the fractional values line up with the Xs. Furthermore, the denominator of the fraction is related to the amount of contiguous Xs. This means we can multiply by the number of contiguous Xs to get integers. The numbers on the board now looks like the picture below, where the nonogram squares are higlighted. The board still has invalid numbers, so these must be corrected with the chess pieces. At first I thought the pieces should move like normal on a 9x9 board. However, as hinted in the comments the chess pieces behave differently. 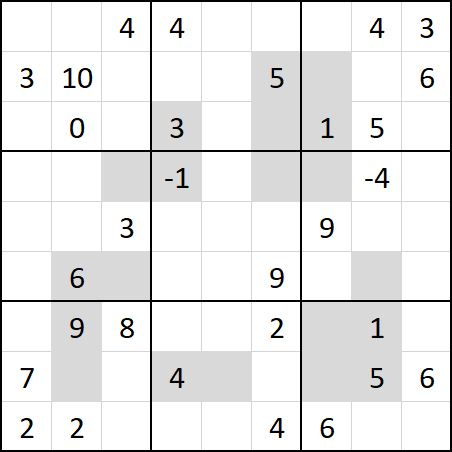 Instead they move on the 3x3 grid of larger boxes while keeping their position in the box. 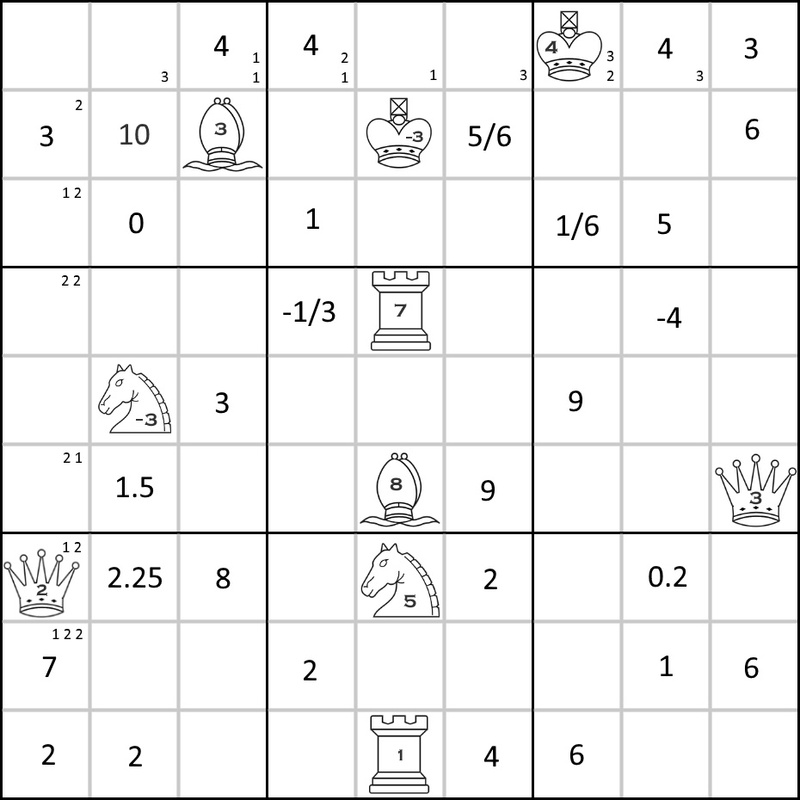 For example the -3 king can move to the 10 in the first box. After the chess pieces make their move, their number is added to the cell. In the previous example the 10 would become a 7. Doing this to all the chess pieces results in the following image with the changed cells highlighted. 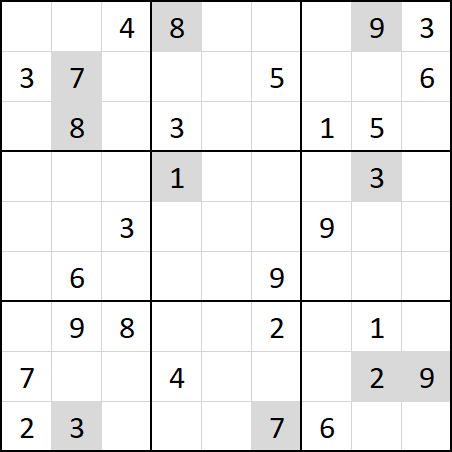 Finally, we have a valid Sudoku board and just need to solve it normally. This gives the following solution. I also noted that the sequence of all the numbers is -3, -3, 1, 2, 3, 3, 4, 5, 7, 8. If you remove the 3's and -3's (they cancel out?) you get 1, 2, _, 4, 5, _, 7, 8. That's repetitive enough that it might lead to something, but I don't see anything useful to come of it. Not the answer you're looking for? Browse other questions tagged enigmatic-puzzle chess grid-deduction sudoku or ask your own question.